Anion resin is commonly integrated into water treatment systems to reduce tannin, nitrates or alkalinity. Urbans Aqua stocks specialty anion resin for quick shipment. Visit our PDF Library for technical specifications and product manuals on cation resins. Visit our SDS Library for safety data sheets on cation resins. Anion exchange resin has a positively charged matrix with exchangeable negative ions (anions). Positively charged ions are fixed and permanently attached. Negatively charged replaceable ions, usually chloride, keep the resin electrically neutral. Because the bead is positively charged only negatively charged ions are attracted or exchanged. For water treatment purposes anion resin comes in the chloride form (Cl-) or hydroxide form (OH). Anion resin is usually light in color. However, color variation among brands has no impact on its performance. For drinking water applications look for WQA Gold Seal or NSF certified products. Tannin, also referred to as TOC (total organic carbon), is a catch all term to describe water which is not clear. Tannin water may have iron or color bodies in it. 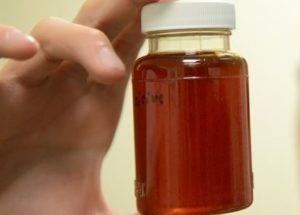 The color tainted water may come or go as it is seasonally affected. For successful outcomes consultation with Urbans Aqua professionals is strongly suggested. Large molecular weight compounds, use macroporous type 1 anion resin. Color of tannin water varies from yellow to dark tea color. Organics have a slight negative charge so they react with anion by exchanging chloride. There will be an increase in chlorides, which have a secondary drinking water standard of 250 ppm. Regenerate frequently @ 8-10 lbs. per cubic foot to reduce organic fouling of resin. Calcium carbonate precipitation may occur. Backwash rates for cation and anion are different 5 gpm per sq.ft. vs 2 gpm per sq.ft. Use upper screen to prevent resin loss. Pre-treat with activated carbon if chlorine levels are high. Chloramine and chlorine will cause breakdown of the resin and increase likelihood of amine (fishy) odor. Anion resin will remove alkalinity and the pH will be suppressed during the service cycle. pH adjustment may be required. Although unseen, the incidence of nitrate contaminated water is rising because of past agricultural practices. The EPA maximum contaminant level (MCL) for nitrate is 10 mg/L as N; maximum contaminant lever set for nitrite is 1.0 mg/L as N.
Use of a Point of Use (POU) filter is not adequate protection against Nitrate/Nitrite contamination. The USEPA recommends a point of entry (POE) or whole house system. Nitrates seriously affect infants- Methemoglobinemia (blue baby syndrome). A type 1 or 2 chloride form anion will address the problem broadly and is commonly used by municipalities who carefully monitor effluent. Effectiveness is subject to competing sulfates. Nitrate selective resins were developed for applications where there is a high sulfate to nitrate ratio. To assure a successful outcome, use of a nitrate selective resin is strongly recommended. Nitrate removal systems are always metered, demand type to monitor water usage. Conservatively rate nitrate selective resin at 7,000-10,000 grains. This is based on the ratio of nitrates to nitrates plus sulfates. Nitrate resins are sold in the chloride form and regenerated with brine. Alkalinity is a measure of how much acid can be added to the water without affecting pH. Alkalinity may consist of bicarbonate alkalinity, carbonate alkalinity and when pH is more than 8.3 hydroxide alkalinity. Dealkalization removes bicarbonate alkalinity, carbonate alkalinity and when pH is more than 8.3 hydroxide alkalinity. In water test results alkalinity is stated as “bicarbonate alkalinity” and “carbonate alkalinity”. Alkalinity is measured by the quantity of standard sulfuric acid to bring the pH to 4.5. Simply put, how many drops of sulfuric does it take to reduce the pH to 4.5. This drop test is converted to an alkalinity measurement. This is like the drop test used for hard water where each drop indicates a level of hardness. Typically, in well water with a pH below 8 there will be bicarbonate alkalinity. Type 2 Anion resin in the chloride form is used to dealkalize water. The chloride is exchanged for bicarbonate, carbonate and other anions present in the water. Like a water softener a dealkalizer is regenerated with salt. To get extra capacity for bicarbonate removal caustic can be added to the brine regenerate. To avoid fishy odor, use potable grade, rinsed anion resin. Urbans Aqua is a stocking wholesaler of Residential & Commercial Water Treatment Equipment and supplies including Ion Exchange Resin; Calgon & Jacobi Activated Carbon; Filterag Plus; GreensandPlus; Pyrolox Advantage; KDF; Birm; Sand/Gravel; Clack, Fleck & AqMatic valves; Stenner Pumps & Parts. We work exclusively with water treatment dealers.